Staffie lovers have defended their beloved pets after a woman and her dog were attacked by a bull terrier in Leyland. 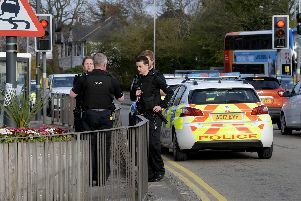 The latest attack happened in Leyland on Sunday, January 27 when a woman and her four-year-old cairns terrier were mauled by a loose Staffie. Hunter, a two-year-old Staffie, belongs to Natalie Winstanley, organiser of the Stand Up For Staffies group in Lancashire. Pic-Natalie Winstanley. Gemma Pots suffered a number of serious bites to her hands and wrists, but her timid cairns terrier received the brunt of the attack. Rox, who already suffered from anxiety around other dogs, had his stomach "ripped open" by the Staffie. According to Ms Pots, the Staffie had recently been adopted by her neighbour after being rescued from a dog fighting ring. It is the latest in a growing list of incidents involving Staffordshire bull terriers in Preston and South Ribble. Dozens of Staffie owners took park in a mass dog walk in Astley Park last summer. They wanted to show the public that their dogs' personality is the product of nurture rather than nature. Ms Pots said more needs to be done to control dogs who have the ability to do serious harm. But her call to stop dogs running free has been met with fierce opposition from dog lovers in Lancashire. Natalie Winstanley, who started Stand Up For Staffies - a pro-Staffie support group - said a ban on walking dogs off lead would not work. Staffies and their owners took to the pathways and pavements of Chorley to show their frustration at calls to class their dogs as 'dangerous'. She said: "It simply wouldn’t work. In this case, the dog was inside the house before it escaped. It has nothing to do with it being off lead. "Also, if the dog is trained to fight, as it was said to be in this case, then that has nothing to do with the fact it was off lead either. "I don’t think a ban should happen. Again it is down to owners. "If you know your dog does not get along with other dogs then do not let it off the lead. "You can’t have a dog on the lead all the time when they are out. Where will they run about? "I have to let Hunter, my Staffie, off the lead to run off energy. He is a two-year-old and full of energy. He needs to run free." Many dog owners across Lancashire agree with Natalie that the ban would be impractical. Karen Beech, from Leyland, said: "It's not the dogs, it's the owners that need training! "Calling a ban on free running time will be detrimental to the dog's health and wellbeing. "Some owners are just idiotic and proud of the bully dog they have. It's not the dog's fault, it's the owner's." Staffie owner Daniel Aaron, from Penwortham, agreed and said "people need to stop blaming the dogs". He said: "We should we blaming the owners, not the dog. "At the end of the day, any type of dog can attack, it just depends on how that dog has been trained. "I've owned my Staffie for four years and I trust him with my life. Because he's been trained very well I can have him around my two-year-old niece with no problems whatsoever." But some dog owners have suggested that "sensible" measures to control dogs in public would be welcomed. Jules Taylor said: "I own a Staffie who was attacked by another dog as a puppy. This means she has a dislike for small dogs. "So as a sensible owner who loves her dog, I keep her on the lead around other dogs, especially small ones. "She never goes over to other dogs, she's just not interested, but there's always the time a dog will run over to her. "It is very upsetting to hear yet again of a dog attack. It is down to irresponsible people being allowed to own a dog that they clearly aren't capable of handling." Lauren Lilliman, from Chorley, added: "I'm a Staffie owner and I love the breed. This woman is right! "Owners need to take responsibility and keep dogs on leads in public places. "My Staffie was attacked by another dog a few years ago and has fear aggression to other dogs. "I keep her on the lead at all times. It doesn't help when other dogs come bouncing up to him because they are off the lead." But Andie Pass, who owns both a Staffie and an American bulldog, said pit-bull type breeds are judged unfairly. He said: "My in-laws dog was killed by an Akita that had got out of his garden and was roaming. "Police refused to do anything because the Akita wasn't a bull breed. "I guarantee that if my Staffie or American bulldog had done anything like that, they'd be destroyed and I'd be charged with having a dangerous dog." "There's no such thing as a bad dog, just irresponsible, uneducated owners." Do you own a Staffie? Do you think the breed is unfairly judged by people, including other dog owners? Let us know what you think in the story's Facebook comments.